In the great Canadian tradition of celebrating winter, sports equipment that lets you face the elements for pure fun is crucial. From toboggans and skis to snowshoes, snowboards and skates, there’s a range of winter toys that can enhance your family life when you’re surrounded by snow and ice. The types and amounts of equipment families have stowed away generally depends on their children’s ages. When kids are little, toboggans, sleds, crazy carpets and flying saucers are in abundance. As they get a little older, skis become the most common. Creating a proper storage solution for your skis, boots and poles is a simple way to protect your investment. The better you take care of them, the longer they’ll last. You could store your skis in the house but if they’re not properly dried out, you might end up with wet carpets or slippery floors. If they are hung on hooks inside the garage, drips won’t matter. Wherever you decide to put them, the best reason to have a designated space is so you won’t have to look around to find everything when the snow beckons. 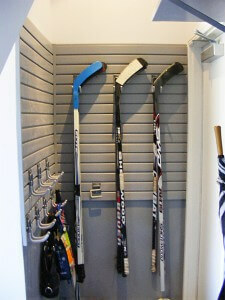 Hockey gear is another type of sports equipment that can be found in abundance in many households. Ideally, if you insist on bringing your hockey equipment into the house, the ripened under armour, long johns, socks and jerseys would immediately find their way into the washing machine while the pads, pants and gloves would dry out on a laundry rack. But since late-night ice times are very common, most of the time after the game is over, the sweaty gear gets taken inside the house and dumped in the basement. Admit it, you’ve done it at least once. There is a middle ground. As long as you take your under gear inside, skates, sticks, helmets and pads can be dried out in the garage so the musk doesn’t infiltrate the house and potentially aggravate your housemates. True, your gear will be cooler when you put it into the bag, but by the time you arrive at the rink, it’s more than likely warmed up. And if you’re playing on a year-round league, for three seasons it’s not even a factor. One family I worked with didn’t want their young boys bringing their hockey gear into the house. The optimal solution was to build a locker in the garage for them to hang their skates, pants, gloves and pads using a combination of baskets, shelves and hooks mounted to an end wall. All the washable stuff went inside with the kids for proper clean up. Winter is an amazing time of the year. An organized garage where you can protect your car from the elements, while also accessing everything you need to play in the snow, makes it that much better. Depending on your budget, needs and taste, I can recommend the perfect cabinets and garage storage systems to accommodate all the athletes in your house. Our suppliers Hercke, Onex and CTECH offer higher quality and more adaptable products than the typical garage cabinets found in big box stores. Or if you’d like to discuss a custom storage system for your family’s specific activities which can be a better fit as well as cost effective, I can assist you with a solution to make it easy for everyone to use your garage in a way that fits the lifestyle.